Pinay WAHM: A Gold Coin? 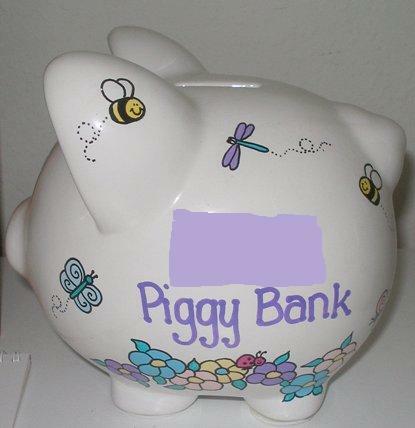 One of the gifts we got the little one on one of her earlier birthdays is this personalized piggy bank. I think we got it on her 3rd birthday. She's been putting all of her coins in this piggy bank since then that it's almost full now. Where does she get the coins? From the Daddy of course. Instead of putting his change in our big jar of coins or in his car's coin dispenser, he would let the little one have them for one condition...she should be able to count the money by herself and tell us the correct amount. A good way to teach her to count money. Dad no longer asks her to do that now since she's quite a pro in that department already. Even if, she still counts them whenever she gets them. Force of habit I guess. Anyway, sometime this week Daddy handed her some coins again. As soon as she got them she started shrieking...a gold coin, a gold coin!! I really thought she got a gold coin but no such luck. It's another country's currency and it looks like, yes, a gold coin. It was a bit smaller than the gold coins we see being advertised. You would think the little one will lose interest in the coin upon learning it's not really gold but no. She still kept it...not in her piggy bank though but with the rest of her "treasures"...some fake gold coins she got with the treasure chest on Christmas. Anyway, wouldn't it be nice if that gold coin is the real deal? It would have made a good 'free' investment for us. LOL. Seriously, investing in gold in any shape and form is probably the best investment today. Along with other precious metals like silver, gold's value has remained steady even if everything around it is devaluating. The price of these metals are also at their lowest at this point so it may be a good idea to start thinking about investing in them before the price starts to go up again.